Baseball is all about connections. Players make connections with teammates that extend beyond the playing field and beyond their careers. Management links combinations of people whose connections strengthen the collective effort. As fans, we connect with teams, players, and events, and each of us accumulates a rich fabric of memories, favorites, and unfulfilled wishes. Every baseball experience enriches that sense of connection not only with our own past but also with the history of the game we love. 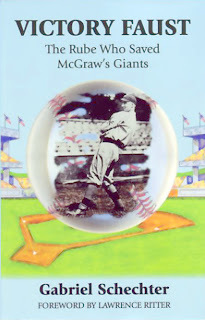 The forging of baseball connections is at the heart of Deadball: A Metaphysical Baseball Novel by David B. Stinson, a self-described "recovering lawyer" (published by Huntington Park Publications, at $15). Its central character, Byron Bennett, is a former minor league third baseman currently stuck in a low-profile minor league job but mainly obsessed with the game's past. As such, he is a baseball Everyman, part insider and part fan. 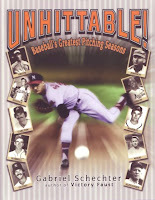 As Stinson writes, "It doesn't matter where the game of baseball is played, nostalgia is an essential component--a place where the past and the present exist side by side, commingled amongst the fans with the memories of their youth and the athletes playing in the shadow of those came before them." Bennett takes this "nostalgia" to extremes--in the view of his friends and ex-wife. When his boss cautions him to "stop obsessing about the past," he protests, "I'm not obsessing about the past. I'm a historian! That's what we do. If you loved baseball like I do, I'm sure you'd feel the same way." How many of us have said that to our friends and family! But we can't help it. We can't watch a game without noticing that the pitcher doesn't have command of his curve the way we've seen before, or that the batter's stance reminds us of someone else's, or that the trajectory of that home run is the highest ever. These observations and echoes seep into our consciousness and enrich our enjoyment of the game. It's only a short step to pursuing these connections actively rather than waiting for them to come to us while we watch a game. Bennett, a lifelong Orioles fan who played and now (in 1999) works in their farm system, is intrigued by Union Park, the home field of the glorified Orioles of the 1890s. Visiting Baltimore, he wanders the neighborhood of the long-vanished park and catches glimpses of the past. He also meets Murph and Mac, enigmatic, ghostly figures who feed his curiosity about the old parks. He feels compelled to visit Tiger Stadium for the first time before it is torn down at the end of the season. En route, he checks out the former site of Forbes Field, where he meets a man who identifies himself as George Grantham, a long-dead infielder for the Pirates in the 1920s. That disconcerts him but also spurs him forward. He senses some connection between Grantham and the Murph/Mac duo from Pittsburgh, but can't pin down anything tangible. He can't even find Murph and Mac agan back in Baltimore. Returning to the eating place where he met Mac, he finds that it has been boarded up for years. So goes Bennett's pilgrimage into the past. The bulk of the novel concerns his several trips to cities that housed the old parks--New York, Boston, Cleveland--with side-stops along the way. Most of what he finds is inconclusive; he can get close enough to the past for brief glimpses, but they don't add up. Passing through Ohio, he finds himself not far from the birthplace of Cy Young and detours to check that out. The result is enigmatic; he sees an apparition of Young sitting on the front porch of his old home and goes up to talk to him, but is deflated when the baseball immortal utters only the un-immortal words, "Son, your headlights are on," before disappearing inside the house that soon also disappears. This odyssey is frustrating for Bennett, and by extension for the reader. We want him to find something definite, but it eludes him. He is being tested, it turns out, and only his steadfastness in the face of such prevailing uncertainty makes him worthy of the final discovery that concludes the novel. The reader is tested, too, by what reads at times like a travelogue, complete with the names of every street traversed by Bennett. Stinson's style is straightforward and casual, as if he's just along for the ride, too, not even in control of what happens next. 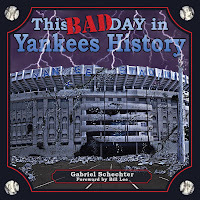 Midway through I found myself thinking, "The payoff had better be worth it," and following Bennett as he scours the baseball landscape for clues. Is the payoff worth it? Yes. Absolutely. Read it and discover the connections for yourself.